Stacked or rolled, red or green… how do you like yours? For the unfortunate souls who would be off-put by these questions, take heart. I was once in your shoes. I grew up in Houston and spent the majority of my adult life in the Texas Hill Country, just outside San Antonio. In that region, when you ordered enchiladas at a restaurant, it was understood that your plate would have a couple rolled tortillas, filled with cheese or beef or chicken, and smothered with a sauce that complimented the filling, with refried pintos and rice on the side. I grew up on Tex-Mex. I raised my daughter on Tex-Mex. 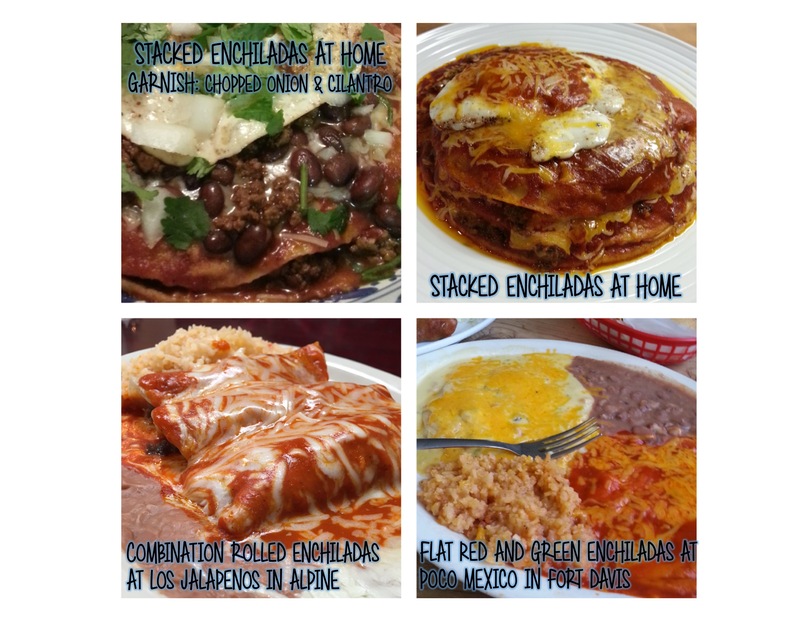 Never did I imagine that there were options such as flat or rolled, red or green sauce, or that someone would consider putting an egg on top of their enchiladas… that Tex-Mex was not the only kind of Mexican food out there. I didn’t appreciate the difference in regional Mexican food until about seven years ago, when my husband introduced me to his stacked enchiladas – a recipe he learned from his family in New Mexico – that forever changed my perspective on enchiladas. Frying the corn tortillas before dragging them through red chile enchilada sauce and layering each saucy tortilla with cheese, beans and taco meat, repeatedly, and topping with a fried egg changed everything. Different regions across the Southwest are known for different styles of Mexican cuisine, and there is a noticeable difference between Southwestern cooking and Mexican cuisine. Southwestern style is known for larger cuts of meat such as pork and beef, and more chile pepper. Mixing red and green sauce is known as “Christmas” when you order it at a restaurant in New Mexico. In Santa Fe, they might even throw in another question – “white or blue?” – when asking which type of corn tortilla you want. Out here in West Texas, enchiladas are different. You can order the rolled tortillas, but flat or stacked enchiladas (also called “enchiladas montadas”) are also available. When we order enchiladas at restaurants, my husband always gets a fried egg on top of his – just like we make them at home. The stacked enchilada is a little easier to create than the rolled enchilada, but the flavor is by no means the same. With the stacked version, you have a larger surface to cover with your “fillings” and you can stack it as high as you dare. I prefer two corn tortillas layered with cheese, taco meat and beans, topped with a fried egg, but a triple-decker is no stranger to my plate. Enchiladas montadas are a satisfying homestyle meal that will change the way you think about enchiladas. Have ready your cooked taco meat and/or beans. Heat some oil in a pan. Throw a corn tortilla in the oil, turn it over after it starts bubbling a little… cook the other side about the same. Remove it from oil and put on a plate. Do two more – so you have three. Let the pan cool, add a can of your favorite enchilada sauce. Heat it up so it bubbles a little, but don’t scorch it. Put one of the tortillas in the sauce, cover it completely, and let it heat up. Take it out – I use a spatula so that I don’t break the tortilla – and place it on a plate. Layer about a handful of shredded cheese, a couple spoons of taco meat, and a couple spoons of beans. Do another tortilla in the sauce. Repeat what you already did. Then do that one more time. If you are not satisfied with the meltiness of your cheese, stick it under the broiler for a couple minutes. I don’t normally have to do that since the hot taco meat and beans will melt the cheese nicely. Fry an egg and put it on top of your stack of enchiladas… drizzle it with enchilada sauce. Garnish with chopped onion and cilantro if you want a little extra flavor.